If you think the iPhone 6 Plus is expensive it's time to think again. At £789 pounds, the 128 GB iPhone 6 Plus is a bargain compared to Lamborghini's latest smartphone, the 88 Tauri. How much does this smartphone cost exactly? $6,000 or just shy of £4,000. Of course, Lamborghini isn't exactly bashful about its price. 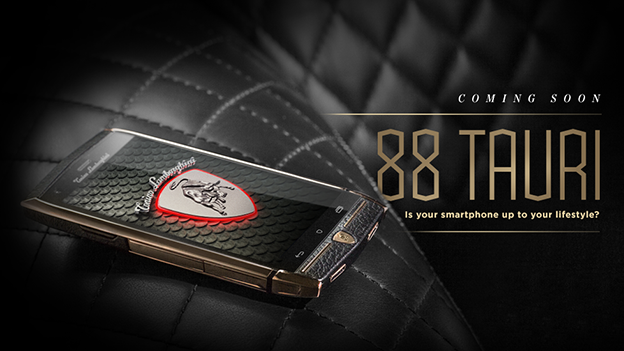 Its launch video it proudly boasts that the 88 Tauri will give you the world's most expensive selfie. So what do you get for a phone that costs several times the average monthly salary? The 88 Tauri comes with a leather and steel case, a five inch screen and is powered by a quad-core Qualcomm 801 processor. Yep. That $6,000 buys you a smartphone similar to one that launched earlier this year. Of course, like the Porsche designed BlackBerry P9883 and Vertu's range of high-end smartphones, its value is less about what has on the inside and more about what's on the outside. Only 1947 units are being made which should add to its sense of exclusivity. Don't expect to see this outside of Chelsea and Knightsbridge, or abroad in places like Dubai. The question now is, will we ever see a luxury smartphone that blows away all over handsets both in terms of its looks and specs? Who knows?